Welcome to Casual Lake Living! This rustic 5 bedroom lakefront home sits on an prime acre of grassy yard overlooking Lake Michigan and includes 100 feet of private shoreline. 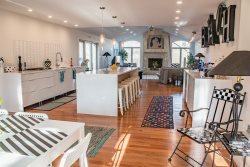 The main level of the home features a large living room and dining room combo with sweeping lake views, huge brick wood burning fireplace, large harvest table with seating for 10, and wet bar with mini fridge. There is also a four seasons type room with additional fridge south of the living area. Both of these rooms open up to the wrap-around patio deck and the large backyard, where guests can take advantage of the stunning view from the bluff, which overlooks the private beach and Lake Michigan. The kitchen is adjacent to the dining area and has a new stove, dishwasher, and fridge. Down a hallway from the kitchen is the bathroom and laundry area. A door to the north leads outside to the outdoor shower and then to the beach access stairs. There is a another living area located on this level with a flat screen TV and couch as you near the front breezeway. The second level is where all five bedrooms are located, along with a full bathroom. There are three bedrooms made up as king-size beds and two bedrooms that each contain two twin beds. Each bedroom has cable and new flat screen TVs. Please note that there is no central air conditioning in this house. Each bedroom has it's own window mounted AC unit in addition to a large floor AC on the main level that keeps the bedrooms nice and cool. Casual Lake Living is a great way to keep an eye on the budget but still have your feet in the sand! Jon has been very helpful and accommodating. It is a Casual Lake Living experience for sure. We love being on the Lakefront.